The annual, big bank “stress tests” by the Federal Reserve became standard procedure after 2008. 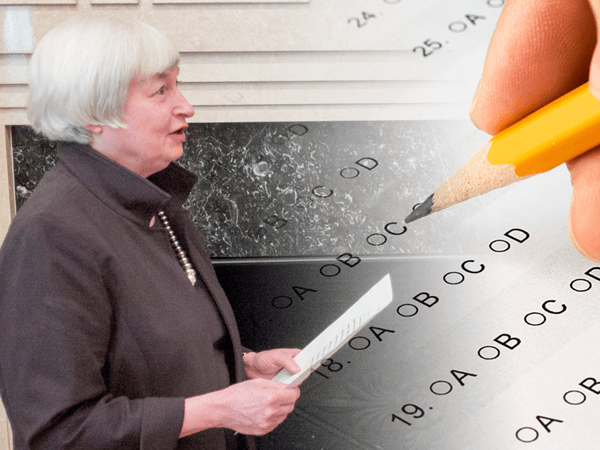 But as this year’s tests come to an end, the Fed is talking about loosening the rules. The Fed’s stress test is designed to evaluate how big banks would respond in the event of a major market crisis. They serve as a preventative measure against a repeat of our last meltdown, when banks assumed irresponsible risk, were caught unprepared, and contributed to a larger economic collapse as a result. 1) A quantitative portion that uses objective, numerical analyses. 2) A qualitative portion that relies on Fed officials’ subjective opinions. The Fed gives banks a negative hypothetical scenario, and then tests their reaction based on both of these portions. The strategy behind this approach is to combine hard data with human intuition, in order to get a balanced view on big banks’ strength. Banks must satisfy both portions to pass the test. The test isn’t infallible, but it’s better than nothing. Our last banking crisis taught us that lesson the hard way. However, now the Fed is getting ready to drop a key portion of the test, which will make it easier for big banks to pass and potentially puts Americans at risk. For 21 of the 34 big banks required to participate, the Fed says it will no longer require them to pass the subjective, qualitative portion of the test, with officials saying the same should soon be done for the remaining 13 banks as well. First of all, this qualitative portion is the hardest part of the test to pass. You’d assume the quantitative, numerical portion would be toughest, but banks can easily manipulate their data to meet Fed requirements. In the words of author Charles Seife, “Figures lie and liars figure.” It’s much easier for the big banks to satisfy arbitrary statistical standards than to fool the critical eye of the Fed itself. Second, falling short on the Fed’s subjective evaluation was causing banks to fail the test altogether, putting a squeeze on their business — hindering shareholder distributions, limiting payout requests from the Fed, and garnering bad publicity. So now, most banks will only have to satisfy the easy portion of the test in order to pass. And soon, the rest might only have to do that as well. With this change, the Fed is making it easier for banks to engage in dangerous behavior, stripping their accountability structure, and trusting them not to make the same mistakes that shattered the economy nine years ago. As the Fed slowly unleashes big banks to run amok once again, Fed Chair Janet Yellen is proclaiming Americans have no reason to worry. Less than a year later, the global economy was in shambles. Is history about to repeat itself? Have our policymakers learned nothing? Are they making the same mistakes all over again? When the economy hits its next downturn, don’t get caught unprepared.